Rock Island National Cemetery was established in 1863, in an area was set aside to bury Union soldiers who died while serving as guards at the large Confederate prison camp established on Rock Island. In 1868, the inspector of national cemeteries reported that the Rock Island cemetery contained 136 remains, including seven unknowns and six women and children. He described it as rectangle of 216 feet by 96 feet, enclosed with a "paling fence." At the time, the arsenal's commanding officer, General Thomas Rodman, indicated that the location of the burial area would ultimately conflict with his plans for extending arsenal-complex buildings. He recommended the remains of individuals currently interred at Rock Island be moved to the upper end of the island; the inspector of national cemeteries further suggested that Civil War decedents interred in Oakdale Cemetery in Davenport, Iowa, be removed to the new site on Rock Island, as well. 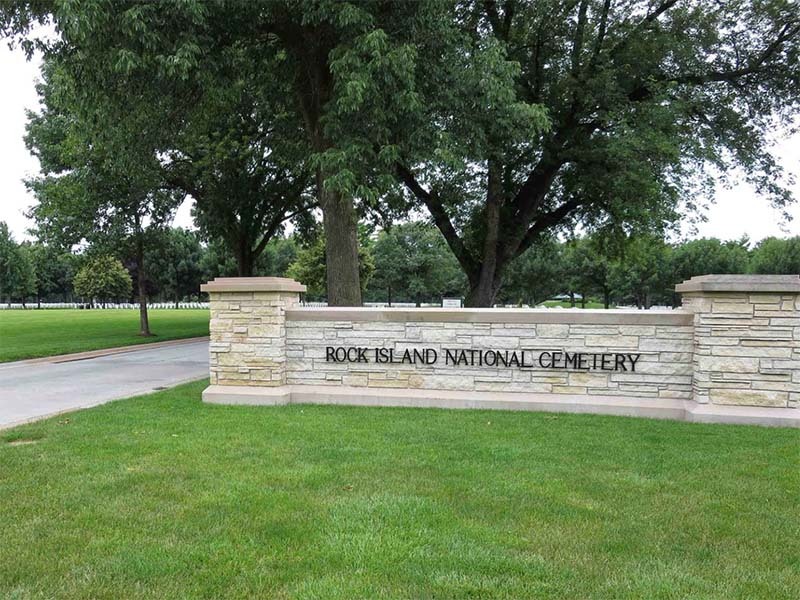 Subsequent property transfers from the Rock Island Arsenal Reservation in 1926, 1936 and 1950 brought the national cemetery to its present 31.5 acres.